Every now and then we step out of ourselves and take on an alternate persona. For me, this is akin to the person I become after a scotch on the rocks…or two…okay three! And yes, I did say scotch; though I can be a pink, frilly cocktail kinda girl too – hand me a Prosecco with berries any day –I’m a closet scotchaholic! That aside, after a couple down the hatch, I transform – it’s a chemical thing! Now I’m not saying I’m one of those loud, obnoxious and mean drunks – ok, loud and obnoxious, never mean though! But somehow, after a few drinks I’m brassier and ever so entertaining – at least by my own interpretation. And I spend a great deal of my time trying to convince all those around that I am actually lucid; that my slurred speech and general incoherence should be no indication of my well-being. Why fake through the situation? Why not admit that yes, I have succumbed? What am I so scared to admit? Most of the time, I’m a pretty lighthearted, easy going (albeit somewhat complicated) extrovert. But every now and then my extroversion gives way to a very introspective, insular side of me. Call it a funk, call it the blues, call it taking stock, call it what you will…but it’s during these times when I wonder if I’m where I should be and doing what I want to do, or whether I’m just trying to keep afloat. Isn’t it better to just be grateful for the stability I already have – whether it’s the roof over my head, a steady job and income, good friends and family? True, these are all good. But I want more. Perhaps it is strange to write about this fish. Perhaps I should go back and talk about the three scotch I downed this past weekend, or something more comedic like the seven year old or the three year old’s latest antics, but I swear, this fish and I are kindred spirits and here’s how I know. After ruling out fish swim bladder disorder or some other fish ailment, I did what I do best: I went shopping…to the pet store. Close to thirty design decisions later (round tank or rectangular, coloured or natural gravel, toys or plants, etc.) we moved Zoom into a larger, more professional tank, in a much busier area of the house and the result? A much happier, active and thriving betta! Although not in words, Zoom had communicated that he was no longer happy in his original fish bowl – he’d outgrown it. And this has served as a little reminder that perhaps I too need to be honest. 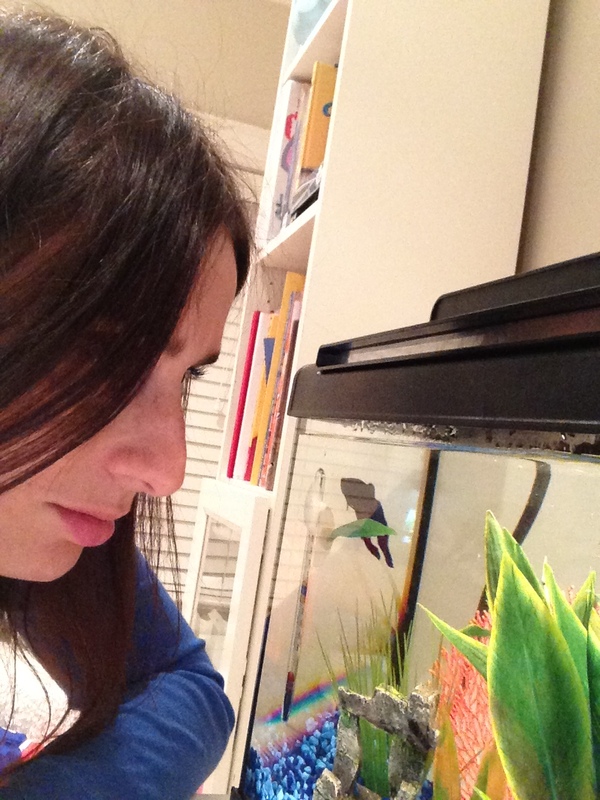 I too need to be courageous and face the music: Have I outgrown my fishbowl? Will I be happier in another? How will that happen? Who will move ME into a better tank? Probably the most frustrating thing for someone as loquacious as me and with very large, grandiose (and perhaps somewhat unrealistic) dreams, is feeling invisible and not being heard. It feels unjust. Recognizing that I don’t have a plant to stick my head in and that perhaps diplomacy, humour and wit (not to mention charm and a killer smile) won’t always save one from circumstance – as I have repeatedly experienced while trying to weasel out of parking tickets, or getting out of sticky situations though it could be that perhaps I’m not as charming as I think or my smile isn’t so, well, killer – what does? What does one do when utterly frustrated, overwhelmed and fighting every instinct to bang one’s fists, throw something and just run away? And, quite frankly, how do you run away when you’re trapped in a fishbowl? I think of my kindred spirit, Zoom. I think of how clever this little fish was in communicating his needs and, well, I’m clever too. Starting tomorrow, I’m breaking out of my fishbowl. Charm, killer smile, diplomacy and brains…I’ve got all of these in my arsenal. And who knows, perhaps I’ll lapse into a persona of courage, and before I know it, I’ll be celebrating in a dapper way with a Prosecco in one hand, and a scotch in the other. The countdown is on…this year is going to be great! Amen!! Here’s to a great year! You said it!! Bubbles and all! Ishala! It’s about time we all have a fantastic year due! No doubt, no ifs, ands or buts! Just do it! Go get ’em! And every other platitude to get some courage and take a risk!! It is human nature to want to check out other fish bowls; to burst out of the one we’re feeling claustrophobic in. It’s what makes life such an adventure! I say go for it! I am raising my scotch and toasting “may you find that perfect, albeit ever elusive, fish bowl”! 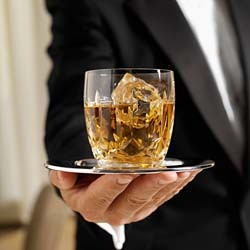 I have no doubt you will achieve all you set your mind to…with a scotch in hand!! !